As Central America re-discovers their cacáo traditions, a caravan of cocoa from there "invades" the USA. Maybe immigrants pooling just south of the border are muling that into the country. Extends the definition of value-add by way of hand delivery. Because clearly the price of cocoa beans -- even at $10 to $15 per bar retail -- ain't enough to keep Hondurans, Guatemalans, El Salvadorans home to husband their cacáo trees exclusively. Something's going on. Ahhh, the messy affairs behind the socio-political economics of chocolate. That'd be inflating the importance of this niche. As a microcosm of the larger world, though, it should be better. Ya know, people get along, they like their neighbors, they prosper together. Everyone harmonizes. For the most part that holds & humans work it out except for the 1% or so of psychopaths that lead to bleeding headlines which agitates the remaining peaceable types who think 'damn, gotta get mine before this whole shithole blows'. Whether Fresco operates in the red or black, it can't fake this -- a 100% unsweetened chocolate -- because there's nothing to fall back on. Skills required. 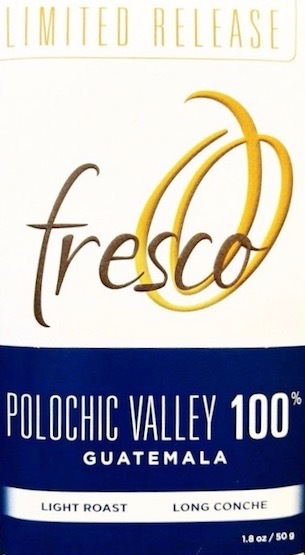 Have some: unsweetened chocolate by Fresco utilizing cocoa sourced from Guatemala. A kind of primer for the current state of the bittersweet pursuit of happiness. The cocoa nuts comprising this bar contain some fat onboard-lipids &/or Fresco saddled them up with add'l cocoa butter. Could be as much the former as the latter since Central American cocoa crops in recent years tip the scales up to nearly 60% lipid content. Translates either way into excellent tolerance for an unsweetened. Never an off beat or brash cadence. Fresco gives it the light roast / long conche treatment in some well-set parameters. While shy of the most inviting 100% -- initiates will be taken aback by the overall continuum -- it more than holds its own as palatable. Take as a condiment which will complement just about anything from dishes to your day. All redolent of the origin, the flavor, the processing, & interrelationships showing incremental progress. Yes, the taste of progress.